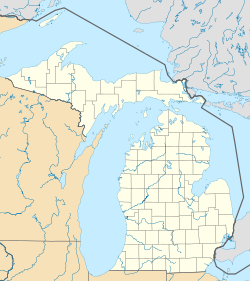 Carney is a village in Menominee County of the U.S. state of Michigan. The population was 192 at the 2010 census. The village is within Nadeau Township. Carney is part of the Marinette, WI–MI Micropolitan Statistical Area. Carney began as a station on the Chicago and Northwestern Railroad in 1879. The village was named for Frederick Carney, who owned a warehouse at the town site. According to the United States Census Bureau, the village has a total area of 1.00 square mile (2.59 km2), all land. As of the census of 2010, there were 192 people, 83 households, and 55 families residing in the village. The population density was 192.0 inhabitants per square mile (74.1/km2). There were 92 housing units at an average density of 92.0 per square mile (35.5/km2). The racial makeup of the village was 97.4% White, 0.5% Native American, 0.5% Asian, 0.5% from other races, and 1.0% from two or more races. Hispanic or Latino of any race were 0.5% of the population. There were 83 households of which 22.9% had children under the age of 18 living with them, 53.0% were married couples living together, 8.4% had a female householder with no husband present, 4.8% had a male householder with no wife present, and 33.7% were non-families. 27.7% of all households were made up of individuals and 12% had someone living alone who was 65 years of age or older. The average household size was 2.24 and the average family size was 2.73. The median age in the village was 47 years. 16.1% of residents were under the age of 18; 5.7% were between the ages of 18 and 24; 23.9% were from 25 to 44; 35.4% were from 45 to 64; and 18.8% were 65 years of age or older. The gender makeup of the village was 52.6% male and 47.4% female. As of the census of 2000, there were 225 people, 92 households, and 57 families residing in the village. The population density was 226.1 per square mile (86.9/km²). There were 97 housing units at an average density of 97.5 per square mile (37.5/km²). The racial makeup of the village was 100.00% White. Hispanic or Latino of any race were 0.89% of the population. There were 92 households out of which 25.0% had children under the age of 18 living with them, 50.0% were married couples living together, 9.8% had a female householder with no husband present, and 37.0% were non-families. 32.6% of all households were made up of individuals and 17.4% had someone living alone who was 65 years of age or older. The average household size was 2.42 and the average family size was 3.12. In the village, the population was spread out with 25.3% under the age of 18, 8.9% from 18 to 24, 23.6% from 25 to 44, 25.8% from 45 to 64, and 16.4% who were 65 years of age or older. The median age was 40 years. For every 100 females, there were 97.4 males. For every 100 females age 18 and over, there were 95.3 males. The median income for a household in the village was $31,111, and the median income for a family was $32,750. Males had a median income of $28,750 versus $28,333 for females. The per capita income for the village was $15,481. About 12.7% of families and 11.1% of the population were below the poverty line, including 14.0% of those under the age of eighteen and 7.4% of those sixty five or over. Carney shares their local K thru 12 School with the neighboring town of Nadeau. Their team mascot and logo is the wolf (i.e. Carney-Nadeau Wolves). Carney-Nadeau is a Class D school (smallest class in Michigan). Their girls basketball team won state championships in 1989, 1990 and 2001. ^ Chicago and North Western Railway Company (1908). A History of the Origin of the Place Names Connected with the Chicago & North Western and Chicago, St. Paul, Minneapolis & Omaha Railways. p. 52. This page was last edited on 24 February 2019, at 20:36 (UTC).